Ticketer, the UK’s leading provider of bus ticketing technology, is delighted to announce that Tenzing, the UK-based independent private equity firm, has invested in Ticketer. Tenzing specialises in investments in high growth SMEs across the UK and Ireland, supporting high performance management teams with which it has a shared vision. Since entering the market in 2010 Ticketer has grown to become the UK market leader, at the forefront of smart electronic ticketing technology across the bus sector. Ticketer’s software enables passengers to use the latest payment technologies, whilst providing its operators with real-time performance insights to improve efficiency, service levels and profitability. Ticketer has achieved revenue growth of over 50% year-on-year over the last three years, and the backing from Tenzing will enable the company to accelerate its new product development plan and ensure that it stays ahead of rapidly changing customer trends and demands. Tenzing has bought into the management team’s business plan and vision for the future and is committed to supporting the team in achieving those goals. Established in 2009 and entering the market in 2010, Ticketer inspires the personalisation of public transportation, through market leading ticketing products that are customised for operators, and individualised to the lives that passengers lead. Committed to making public transport better, Ticketer drives transportation income, insight and operations for operators and makes travel easier for passengers. Operators can access ticket sales data, view performance and manage fares from anywhere with an internet connection. The system is fully supported by a hosted service, nothing is installed on site, so costs are low. Furthermore, the annual per ticket machine license includes ongoing upgrades, ensures that there are no hidden costs, and delivers the lowest Total Cost of Ownership. Tenzing Private Equity is an independent private equity firm, based in London, that targets buyout investments in high growth businesses, valued between £10m and £75m, across the UK and Ireland. 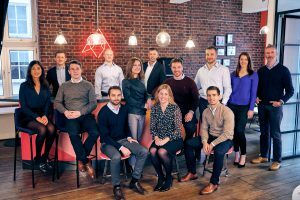 Founded in January 2015, the firm invests in niche market leaders and challenger businesses across a broad range of industry sectors. The firm believes in supporting, inspiring and investing alongside high energy, high performance management teams with which it has a shared vision. Tenzing brings unique access to a select group of entrepreneurs, its Entrepreneurs Panel, who have founded and grown some of the best lower middle market SMEs through multiple successful phases of private equity investment. Access to this growth ecosystem provides the Tenzing portfolio companies with unrivalled insight, experience and mentoring to support their high growth development.